Maintaining a pleasant and neat appearance for any commercial business that serves the public is critical. Professional service always ensures that your company has its best foot forward. 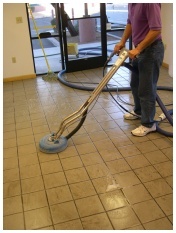 Too many businesses wait past the "point of no return" before they clean their carpet, tile, and upholstery. Let Amazing protect your valuable investment and image with a ongoing maintenance schedule. Amazing will work around your unique business hours to deliver top quality cleaning of carpet, tile, stone, and upholstery. Due to the many variables of servicing commercial locations; Amazing wants to consider all possible cost savings and suggestions to offer your business. So call Rick today to set up consultation. Insurances and references available upon bid request.